Going By The Numbers: Will Daytona 500 Success Make Or Break A Season? Home / Cup Series / Going By The Numbers: Will Daytona 500 Success Make Or Break A Season? Dale Earnhardt, Jr.‘s Daytona 500 win could spell great things down the road like Jimmie Johnson in 2013, or it could be the only highlight of his season. Which one will it be? 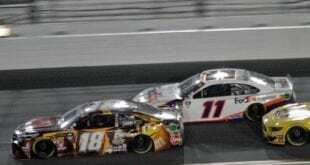 Kevin Rutherford February 25, 2014 Cup Series, Going By the Numbers, Kevin Rutherford, Tom Bowles Comments Off on Going By The Numbers: Will Daytona 500 Success Make Or Break A Season? This week, in Going By The Numbers we thought a special win deserved a special column. After his first victory in 55 races, Dale Earnhardt, Jr. finds himself virtually “locked in” to the Chase. But does a win in the sport’s biggest race, here in February ensure NASCAR’s Most Popular Driver will contend all the way through November? With a mixed bag for recent 500 winners, we went inside the numbers to argue both sides of how Earnhardt’s newly-minted 2014 “success story” will ultimately turn out. Dale Earnhardt, Jr. hasn’t been a pushover lately. For a period of time in the mid to late-2000s, NASCAR’s most popular driver seemed to have his head in the sand. Years of middling results with Dale Earnhardt, Inc. led to a string of equally frustrating seasons at Hendrick Motorsports. A resurgence in recent years, after getting paired with crew chief Steve Letarte brought him closer to championship contention, though the wins haven’t exactly flowed freely. Now, who cares what he does for the next 25 races? With the new points system implemented this year, Earnhardt’s already in the Chase. In years past, nothing was for sure even after winning the Daytona 500. Drivers could — and did — falter, losing the edge they held on the series after the first race. Racers faded from prominence into obscurity, becoming nothing more than an asterisk, a “Hey, this guy won the Daytona 500 this year, remember?” sort of trivia answer. Junior doesn’t have to worry about that. From here on out, it’s all about what he does the final ten races, not what he accomplishes between Daytona and Richmond. If last year is any indication, hopes should be high for Junior Nation — for two reasons. First, remember vintage 2013-era Earnhardt during last year’s Chase? He rattled off an average finish of fifth in the final nine playoff events, a number that jumps to eighth when adding the 35th-place effort he suffered in the Chase-opening race at Chicagoland. 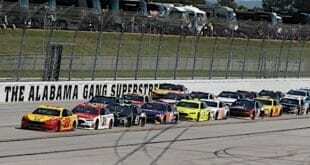 That finish would have been inconsequential with the new Chase and its elimination rounds; in fact, he would have been the champion last year under this format. Earnhardt’s also now made four straight Chases, no small feat even in the “expanded” playoff era. At age 39, he’s ripe. He’s ready. If sub-30th-place finishes can be avoided, Junior’s just as good as teammate Jimmie Johnson in the clutch. Speaking of Johnson — he won last year’s championship, coasting past competitors for his sixth title. Where did he begin the 2013 season? Yep, in Victory Lane at Daytona. There’s been a bit of a recent precedent for a “Daytona 500 curse,” inflicting the winner of the season’s biggest race and keeping them out of contention for the title. However, Johnson struck that tendency down with a resounding victory and consistency throughout the last twelve months. Why not expect his Hendrick teammate to go the same route? This time, Earnhardt at least has a handicap: the new Chase format. He’s in no matter what happens. At this point, it’s all about staying focused — or, at least focused enough. September can’t catch Earnhardt and the No. 88 team off-guard, to the point that it’s simply not ready to compete at a higher level once NASCAR jumps from Richmond into the postseason. Otherwise, he could end up like Matt Kenseth, who in 2012 won twice in the Chase but only managed seventh overall after some lukewarm finishes — all during his Daytona 500-winning year. The 2011 titlist, Trevor Bayne, didn’t even run the full season while 2010’s victor, Jamie McMurray, couldn’t even make the Chase. Heck, Matt Kenseth won the Daytona 500 and the second race of the year in 2009, but didn’t even make the Chase either. So now, it’s all about harnessing momentum, a skill Letarte should excel at in his final season atop the pit box. Don’t win a race the rest of the year — whatever, that’s fine. But don’t enter the Chase like that football player who’s slacked off all offseason and suddenly decides to try to turn it on at will. It’s probably not going to go well. For now, give Junior, Letarte, and their crew the benefit of the doubt as the No. 88 celebrates their biggest achievement. He has a precedent in 2013 champion/Daytona 500 winner Johnson in his corner, as well as a very encouraging Chase last year. This win isn’t a fluke. Earnhardt’s coming for the field. One day after my column trumpeting Earnhardt’s success, at Daytona it’s fun to take the Devil’s Advocate perspective. Yes, I saw firsthand the confidence displayed by a driver who’s taken years to build up to that point. There’s a push to “go for broke” in Letarte’s final year, with no guarantee any new crew chief will be able to replicate the chemistry here in 2015 and beyond. The No. 88 appears set up to make a statement. It’s just far from guaranteed. In recent years, Daytona 500 winners have found it more like an albatross around their neck than an actual momentum builder. Perhaps one of the best examples was a family affair: 1998, the year Junior’s dad got the monkey off his back and that lone Daytona 500 victory. In the year John Elway won the Super Bowl in the twilight of his career, some thought Dale Sr. would snag that eighth championship at the ripe old age of 47. One could argue no team had started a season with more momentum. Instead? 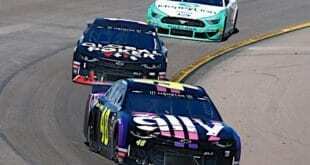 It was Jeff Gordon who ran circles around the competition, while Dale Sr. earned just five top-5 finishes, the lowest he ever had in a full season racing at the Cup level. There was a crew chief swap midseason, Earnhardt dropped outside the top 10 in points by Memorial Day and wound up a disappointing eighth in the standings. Ever since, history leans on the side of plate race momentum as deceiving. 1999? Jeff Gordon won Daytona, only to lose crew chief Ray Evernham during a miserable season. 2000? Dale Jarrett was an exception, second in points but failed to defend his championship, losing out to Bobby Labonte. But at least he came close. From 2001-03, Michael Waltrip and Ward Burton failed to register on the radar screen before the Chase era ushered in a new set of rules. Unfortunately, it didn’t make the Great American Race any more of a long-term momentum boost for the title. Of the 10 Daytona 500 winners, from 2004-13 only two wound up winning it all (Jimmie Johnson, both times in ’06 and just last year). Dale Earnhardt Jr., with his first win in ’04 was the only other driver to finish inside the top 5 in Chase points. That’s a 30 percent success rate, far less than you’d expect from Daytona and clearly not a sure bet. Instead, over the past decade the failures of these 500 champions are what’s made headlines. In 2005, Jeff Gordon won his third Harley J. Earl trophy but wound up missing the only Chase of his career. Ditto Matt Kenseth in 2009, despite going 2-for-2 on Victory Lane to start the year. Then there’s Ryan Newman, who won his lone 500 in 2008 only to miss the postseason and get canned by Roger Penske nine months later. Clearly, one-race momentum, with the different set of rules plate racing requires doesn’t always translate down the road. That’s the case, sometimes even on unrestricted tracks. In Earnhardt’s last two wins with Hendrick, both at Michigan, he failed to finish inside the top 10 the following week. Phoenix, Las Vegas, and Bristol will be critical for him this season to prove that February was no fluke; last year, he earned an average finish of sixth at those tracks. Failing to run up front at the very least will cause fading momentum, especially with other teammates in Johnson and Jeff Gordon looking like potential title contenders. Earnhardt, with three second-place finishes the last four years at the 500, was due for a breakthrough victory. But to take this argument a step further, plate racing is not the elephant blocking that championship door. It’s consistency, running up front week in and week out along with the ability to win more than one race per season. Junior may have earned himself a playoff spot last week but to truly make a legion of believers, he’ll need to end the year with two or more. With a week’s worth of distractions, challenging team focus it’s going to make things that much harder going forward. We know Earnhardt has the confidence; but is he and that team truly up to the challenge?